- Alcohol and Recovery: Booking now open! Scottish Health Action on Alcohol Problems (SHAAP) and the Scottish Alcohol Research Network (SARN) are pleased to organise the lunchtime 'Alcohol Occasional' seminars. 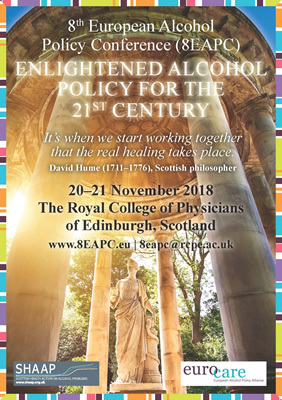 These showcase innovative research on alcohol use and provide the chance for researchers, practitioners and policy makers and members of the public to hear and discuss alcohol related topics, over lunch in the historic Royal College of Physicians of Edinburgh at 9 Queen Street, Edinburgh. These FREE events start at 12.30 - 14:00 and you must register to attend. Click on the event title to register. SHAAP is pleased to organise this FREE event in conjunction with organisations supporting people in recovery, their families and communities, incl. Al Anon, AA, Scottish Families affected by Alcohol and Drugs and the Scottish Recovery Consortium. This half-day workshop is part of our season focussing specifically on Alcohol and Recovery, and its purpose is to share experiences, celebrate recovery and hear from networks supporting recovery in Scotland. Read our brief summary of the event. 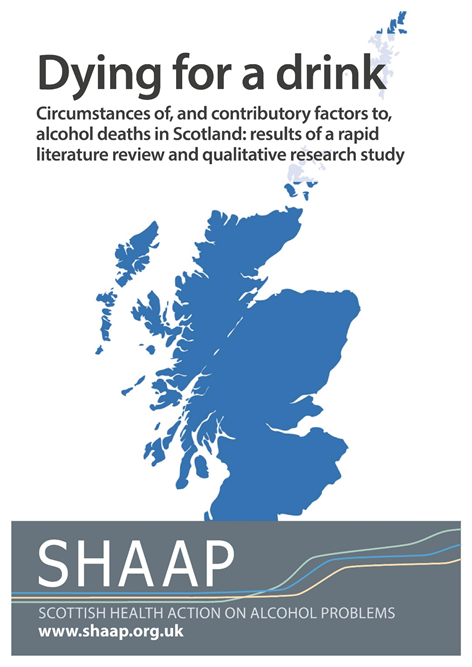 Launch of SHAAP alcohol mortality report at Royal College of Physicians of Edinburgh on Friday 26th October, 12:30-14:00. Scottish Health Action on Alcohol Problems (SHAAP) and the Institute of Alcohol Studies (IAS) are pleased to invite you to this evening event at the Scottish Parliament, hosted by Alex Cole-Hamilton MSP. 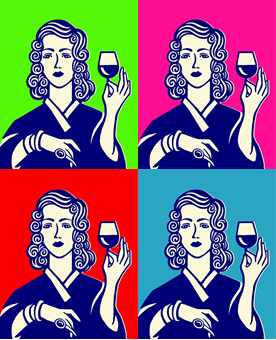 Victoria Troy of Glasgow Caledonian University will showcase a report by SHAAP/IAS on their 2017 seminar series ‘Women & Alcohol’ which looks at globalisation, empowerment, stigma, and the next steps. These events are popular and places are limited. To register via EventBrite, click on the title of the event/s (above) that you wish to attend. Tuesday, 24th October 2017: National launch of SHAAP's 'Alcohol-related Liver Disease: Guidance for Good Practice'. Held at Royal College of Physicians of Edinburgh, the Chief Medical Officer, Dr Catherine Calderwood will address the conference, which is aimed at clinicians, researchers and healthcare professionals involved in the treatment and care of patients with ALD. SHAAP and the Scottish Transgender Alliance (STA) hosted an interactive workshop to present the findings of the Scottish Transgender Alliance (STA) and North Ayrshire Alcohol and Drug Partnership (NAADP) research into trans inclusion in drug and alcohol services. Event details: Wednesday 11th January 2017, 11:00-15:00 in the Royal College of Physicians of Edinburgh. 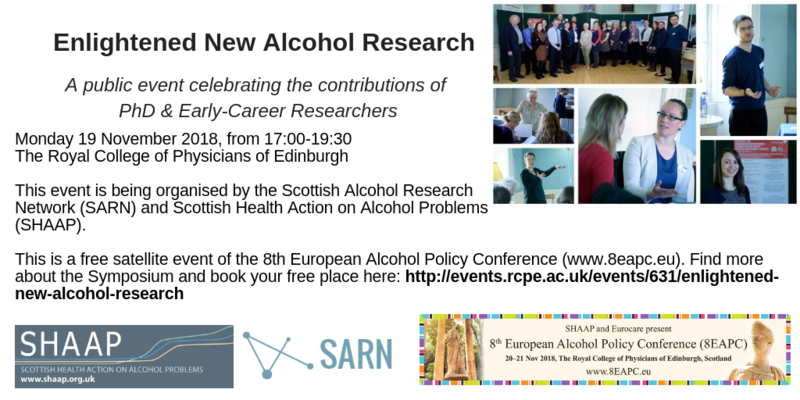 Scottish Health Action on Alcohol Problems (SHAAP), in collaboration with the Scottish Alcohol Research Network (SARN), held a Postgraduate and Early Career Research symposium on 18th of April 2016 at the Royal College of Physicians in Edinburgh. The symposium was a chance for students, with an interest in alcohol research, from across Scottish institutions to come together, and present their research. The overall aim of the Symposium was to build on and strengthen the PhD and Early Career Researchers community which is of great important to both SARN and SHAAP. The day consisted of a number of short presentations made by researchers who are at varying time-points within the academic journey, as well as a number of round table discussions. This was a fantastic opportunity to not only network with peers but it also provided the opportunity to present and get feedback on research, and discuss future research ideas. Scottish Health Action on Alcohol Problems (SHAAP) published a new report, based on research carried out in Glasgow by researchers at Glasgow Caledonian University, “The social context of LGBT people’s drinking in Scotland”. The Parliamentary discussions, facilitated by Jim Eadie MSP, offered the opportunity for MSPs, professionals and members of the public to discuss the research findings directly with the researchers; to engage with members of the LGBT community; and to learn about the LGBT community’s experiences in relation to alcohol. It provided attendees with a better understanding of the social influences behind LGBT people’s alcohol consumption and drinking behaviours and related outcomes.